Not only can growing your own herbs be an interesting and rewarding hobby, but research has revealed that the activity can also be beneficial to health. The presence of plants in the home can improve air quality, soothe eye irritation, alleviate stress, and reduce headaches, not to mention the many benefits that can be obtained from the herbs themselves. Find some of the easiest, and most advantageous herbs to grow indoors. Peppermint is known for its sweet and refreshing taste, which can be enjoyed fresh from the plant in the form of tea. It can be useful for settling the stomach, soothing the mind, and for cooling the body if you are overheated. It requires access to some sunlight, so should be placed on a windowsill when grown indoors. If it is watered regularly, and kept free of pests and diseases, the plant will thrive and can be harvested repeatedly throughout the year. Aloe plants store water in their thick leaves. In order not to "drown" your aloe, make sure that the soil is completely dry before watering the plant. Aloe is well-known for its healing properties. It is a natural antiseptic and anti-inflammatory that should be applied directly to burns and wounds for immediate relief and rapid healing. A branch can simply be cut, and the abundant gel - or sap - will ooze out for topical application. Partially-cultivated plants can be found at most garden centers, or they can be easily propagated by cuttings at home. Throughout growth, aloe requires generous watering once a week and adequate sunlight. Place your aloe near to a window, in a warm environment of around 70 - 80°F (21 - 26°C). To avoid downy mildew, keep your basil in a dry environment and water only the base of the plant. A well-known fragrant herb, basil is very popular for culinary uses, particularly in Italian cuisine. Basil is known to have several health benefits, including lowering blood sugar levels and blood pressure. It can be eaten raw or cooked, and it is often seen in healthy smoothie recipes. Novice gardeners love basil because it is easy to grow in a sunny spot of the kitchen, at a temperature in the range of 50 - 70°F (10 - 21°C). It should be watered little and often, and can be pruned frequently - whenever a few leaves are required, they can simply be torn off, and new ones will grow. As well as being a tasty addition to many dishes and marinades, thyme has several medicinal uses that make it a convenient herb to grow within the household. It has antiseptic and antifungal properties, which are useful for treating wounds and both internal and external infections. The most common method of consuming the herb is in food, but it is also possible to make a mild thyme syrup for cough prevention or an aromatic infusion to treat a common cold. Thyme can be grown on a windowsill or in a sunroom, it requires a temperature of around 60 - 70°F (16 - 21°C), watering once or twice a week, and regular pruning. Echinacea is regularly suggested by herbalists to treat or avoid the common cold, because it is rich in antioxidants that help strengthen the immune system. Echinacea tea is possibly the most popular form of ingesting the plant; however, an echinacea tincture for immunity enhancement can also be easily prepared at home. Echinacea will grow happily indoors if kept in a sunny space at a temperature of 65 - 70°F (18 - 21°C) with regular irrigation. 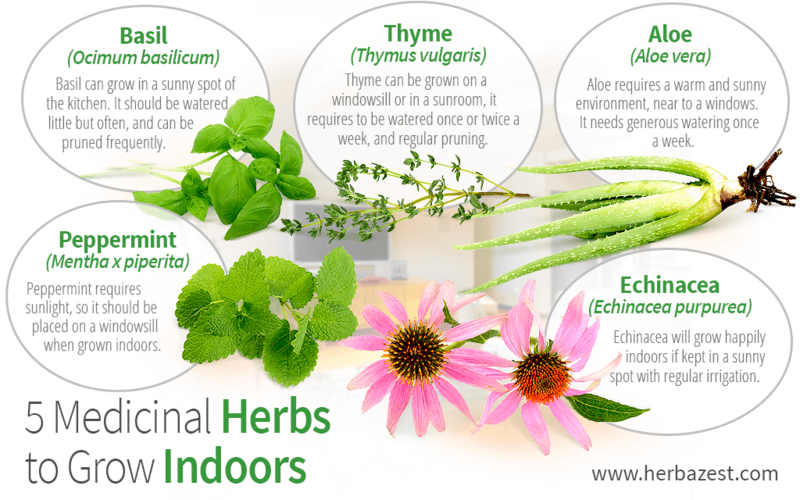 These are just five of many helpful medicinal herbs that can be grown indoors. With some care and attention, it is possible to cultivate these plants year-round, which can be rewarding and extremely satisfying. Not only will the herbs be useful for remedies and cooking, but they will also brighten up the home with their delightful features and pleasant fragrance.